If your production needs requires very large bags, Martini srl offers two models, MX1000 and MX1200. Thanks to these intermittent motion vertical packaging machines, both square bottom and pillow bags can be formed up to a maximum of 480/580mm width. Specific accessories and technical tricks reached in years of experience guarantee the best results and performances. Steel frame (painted or stainless steel). Suitable for the use of heat-sealable film reels, lap seal or fin seal. Film unwinding by means of two motorized pulling belts. Vertical sealing units pneumatically driven. Horizontal sealing units driven pneumatically or motorized. 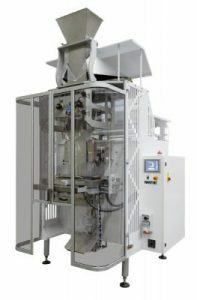 Film unwinding unit equipped with photocell and encoder.